Ever since the entry of mountain bikes into mainstream cycling they have offered a new dimension to winter riding – snow riding! When the roads are downright dangerous the chance to escape across the fields or ride on untreated minor roads with extra grip and wide handlebars is great fun. Where I am now living in Belgium we have a fantastic network of paths, farm tracks, cobbled roads and minor lanes so I couldn’t resist getting out today for what seemed like my first longer ride in ages. 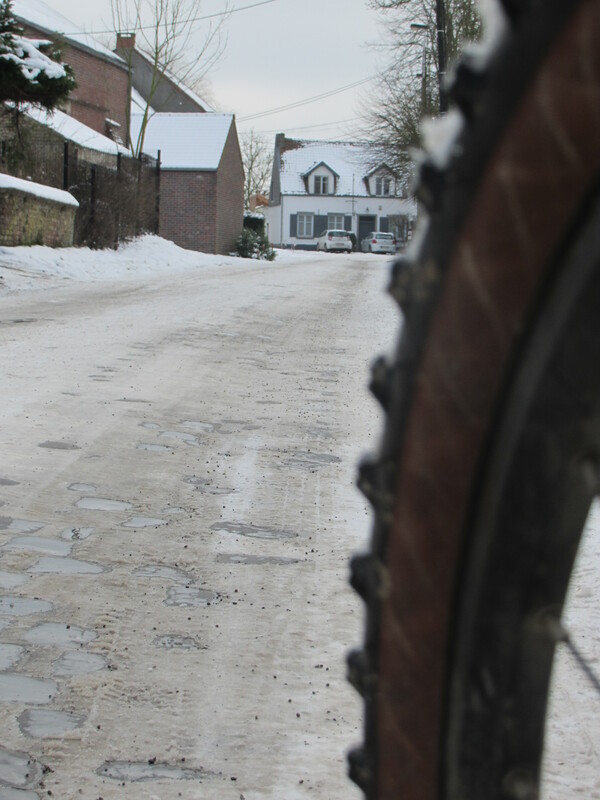 The snow actually flattens out the cobbles to some extent which is great. And a real treat today. There is nothing like a sign at the edge of a field that just points out to the middle that beckons and says “ride me”. And in this case it was on pristine snow with only the footprints of rabbits and foxes. The snow was really soft which made it hard going but I thoroughly enjoyed it. This entry was posted in Life in Belgium, MTB, Musings and tagged Belgium, cycling, mountain biking, snow by kevinmayne. Bookmark the permalink. Thanks, I had forgotten I spoke to the Guardian this week, its been pretty busy. Live CX on Belgian TV again this afternoon, a sneaky treat away from the snow.